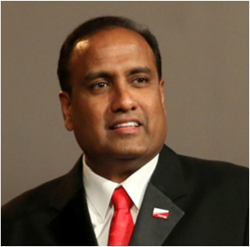 Mahindra NA President & CEO Iyer Named Chair Of India Business Forum For The Confederation Of Indian Industry In The U.S.
Mani Iyer, President and CEO of Mahindra North America will serve as 2016 Chairman of the Confederation of Indian Industry - India Business Forum (CII-IBF). CII-IBF provides a platform for Indian companies investing and operating in the U.S. to address business and governmental issues impacting the U.S. divisions of these international companies. At the Confederation of Indian Industry - India Business Forum’s (CII-IBF) initial 2016 session, Mani Iyer, President and CEO of Mahindra North America formally assumed a leadership role. Mr. Iyer will serve as Chairman of the organization for the coming year. CII-IBF provides a platform for Indian companies investing and operating in the U.S. to address business and governmental issues impacting the U.S. divisions of these international companies. The outgoing Chairman is Vivek Sharma, CEO, Piramal Pharma Solutions. CII-IBF convened for its first set of meetings for 2016 in New York City. At this session, the group met with the Empire Development Corporation, New York's chief economic development agency, and discussed issues of concern to both Indian and U.S. companies with the Business Council for International Understanding (BCIU) featuring Ambassador David Mulford, former US Ambassador to India. The day concluded with a visit to the New York Stock Exchange. “We are pleased to have Mr. Iyer take on this highly visible role for CII-IBF. He will be a strong voice and a great advocate for Indian companies with operations in the U.S. on issues that encourage and support a global economy with a level playing field for all companies and individuals,” said Sumani Dash, Director and Country Head, USA and Canada Confederation of Indian Industry. Mahindra North America (MNA) is part of the US $16.9 billion Mahindra Group’s Automotive and Farm Sector - the number one selling tractor company in the world, based on volumes and the only tractor manufacturer in the world to win the industry’s top two quality awards – the Deming Application Prize and the Japan Quality Medal, care of Union of Japanese Scientists and Engineers. Houston, Texas-based Mahindra North America is a wholly owned subsidiary of Mahindra & Mahindra Ltd. and began selling tractors in the USA in 1994. MNA has since grown rapidly due to high customer satisfaction levels (97%) and strong customer referrals (98%). Mahindra NA now has five distribution points in North America to help meet the needs of its customers and the growing demand for its products. Mahindra’s professional-grade tractors range from 22 HP – 105HP with over 40 model offerings – and include the revolutionary Max and eMax series tractors. The Mahindra Max 24 leads the way in the sub-compact market and feature true tractor performance and capabilities. The Mahindra Max 24 is joined by the industry’s first mid-compact tractor, the Mahindra Max 26 XL, which has compact tractor performance and versatility in a near compact tractor size. All Mahindra Tractors are built with heavy-duty components that allow them to outperform other tractors in their class and are designed to provide consumers with the ability to push more, pull more and lift more, so they can do more, in less time. Combine the superior performance of a Mahindra and the peace of mind of a STANDARD 5 year limited powertrain warranty and you have a rugged workhorse at your disposal. A USD 16.9 billion multinational group based in Mumbai, India, Mahindra employs more than 200,000 people in over 100 countries. Mahindra operates in the key industries that drive economic growth, enjoying a leadership position in tractors, utility vehicles, information technology, financial services and vacation ownership. In addition, Mahindra enjoys a strong presence in the agribusiness, aerospace, components, consulting services, defence, energy, industrial equipment, logistics, real estate, retail, steel, commercial vehicles and two wheeler industries. CII is a non-government, not-for-profit, industry-led and industry-managed organization, playing a proactive role in India's development process. Founded in 1895, India's premier business association has around 8000 members, from the private as well as public sectors, including SMEs and MNCs, and an indirect membership of over 200,000 enterprises from around 240 national and regional sectoral industry bodies. In its 120th year of service to the nation, the CII theme of Build India - Invest in Development: A Shared Responsibility, reiterates Industry’s role and responsibility as a partner in national development. The focus is on four key enablers: Facilitating Growth and Competitiveness, Promoting Infrastructure Investments, Developing Human Capital, and Encouraging Social Development. With 66 offices, including 9 Centres of Excellence, in India, and 9 overseas offices in Australia, Bahrain, China, Egypt, France, Germany, Singapore, UK, and USA, as well as institutional partnerships with 312 counterpart organizations in 106 countries, CII serves as a reference point for Indian industry and the international business community.